Hello, reader! It’s that time again where we reflect on the hot beautiful summer we spent at work and nowhere else. I didn’t make it anywhere this summer, and I’m actually taking my first trip to the beach this summer. It’s August, but I’m trying. My nails aren’t too summery, but I like how they turned out. I’m wearing Model City Polish‘s Awaken to Spring over a gradient of Literary Lacquers‘s Little Sleep Song and Sweet Heart Polish‘s Summer Breeze. When I first started planning this look, I was just going to do a base of Summer Breeze. It’s a very dainty shade of blue, and has a smattering of holo; it would have been the perfect undies on its own. At the last minute, I decided to go for the gradient. It’s very subtle; you can hardly tell it’s there, but that’s the look I wanted. 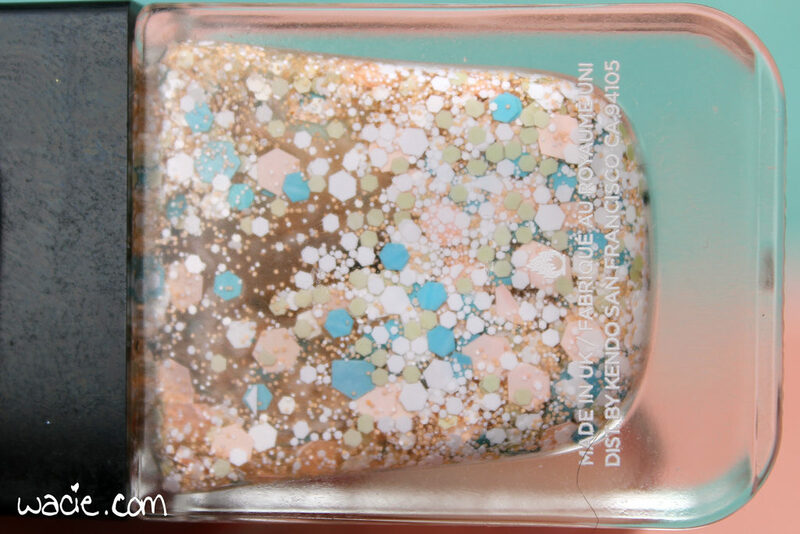 Awaken to Spring is a beautiful glitter topper with rose, aqua, and copper glitters. I love the sparkle in this; it’s colorful but still kind of subdued. It’s perfect over this gradient. 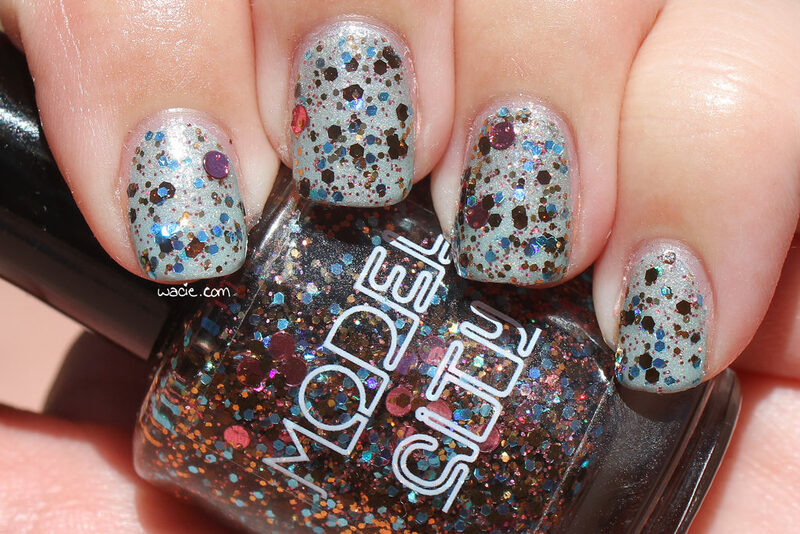 Model City Polish doesn’t make polish anymore (sad). 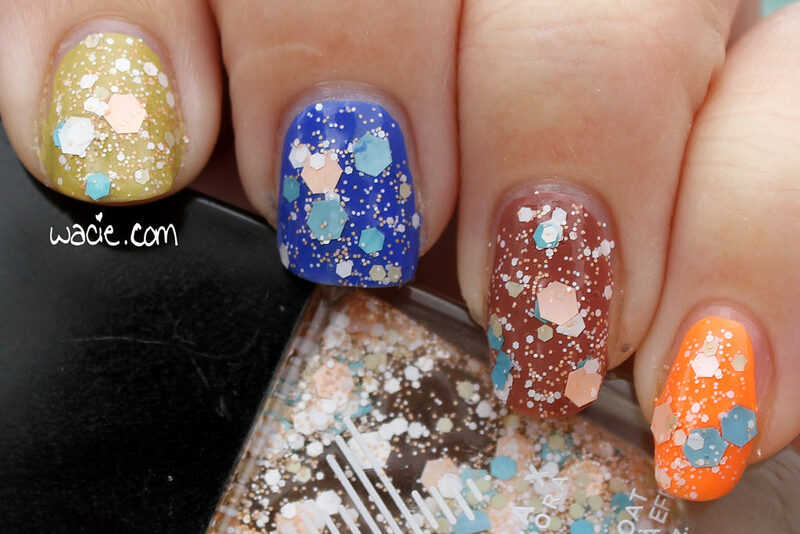 Little Sleep Song and Summer Breeze were box exclusives; Literary Lacquers and Sweet Heart Polishes are available from their respective etsy shops. Welcome back, reader! I’ve been slacking on my swatches, but I’m still working on them. Today I have a glitter topper someone once told me was “terrifying” because it looked difficult to remove. This is Demolition from Formula X for Sephora; I’m wearing one thick coat (basically two) over Marc Jacobs Beauty’s Shocking (pink), Butter London’s Tea and Toast (taupe), Blue-Eyed Girl Lacquer‘s Lighthouse by the Lake (blue), a nameless vintage Maybelline (brown), and Sally Hansen’s Sun Kissed (orange). 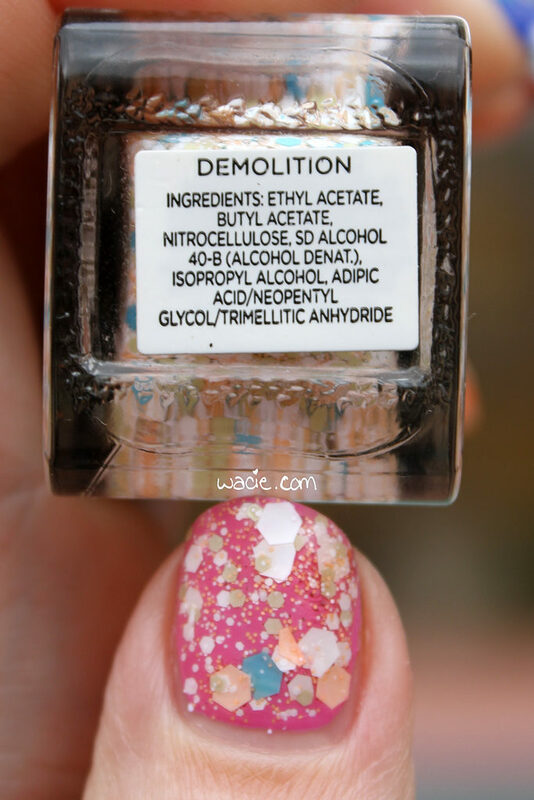 Demolition is a clear-based glitter topper; the glitters are hexes of various sizes and pastel shades, which focuses largely on pastel pink. Application was good; the polish consistency is a little on the thick side, which is necessary to carry these chunky glitters. It dries quickly, though, and with a somewhat textured finish; top coat is definitely required for a smooth-to-the-touch finish. 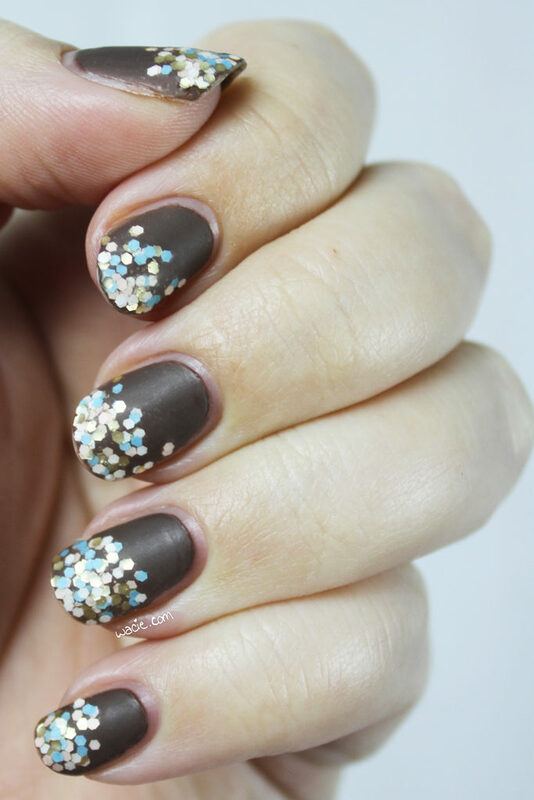 I know these chunky glitters have fallen out of style, but I am still about them. 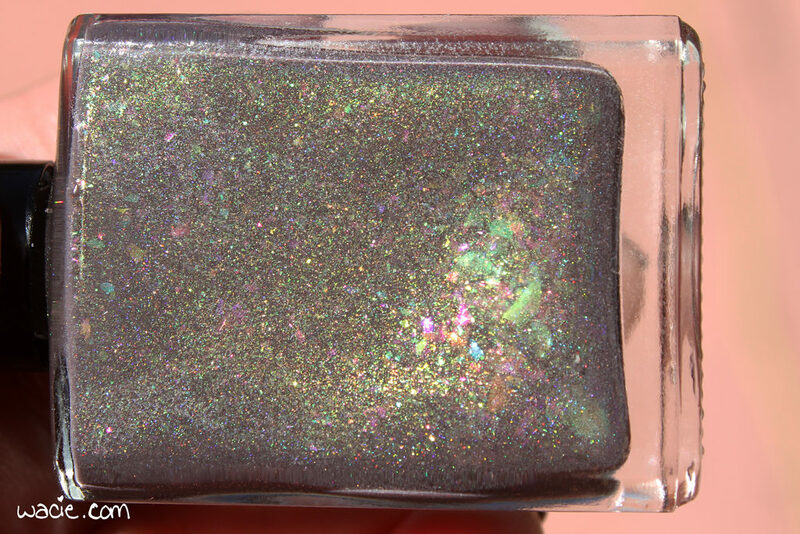 I was super excited to find a polish like this from a mainstream brand as well; they had several color variations on this formula and I bought several of them. It wears pretty well despite being on the thicker side; a lot of heavy glitter toppers like these are quick to chip, but not this one. My only real complaint is that it takes quite a bit of top coat to smooth it down. The Formula X brand was discontinued by Sephora. Another day, another swatch! This blogging from Starbucks thing is really working for me! I don’t know why I didn’t think to do this sooner. 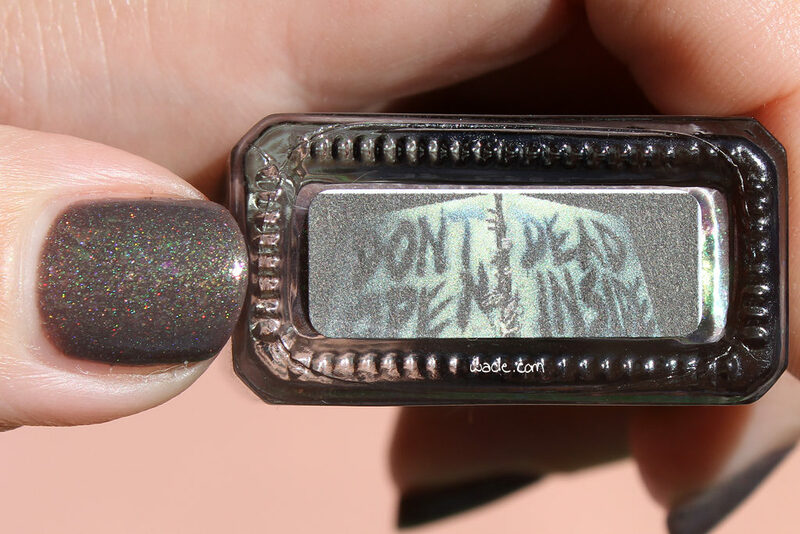 For today’s swatch, I have Bee’s Knees Lacquer‘s Don’t Open Dead Inside, which is another Indie Shop Atlanta event exclusive. I’m wearing three coats with one coat of Seche Vite top coat. I always read this as Don’t Dead Open Inside. 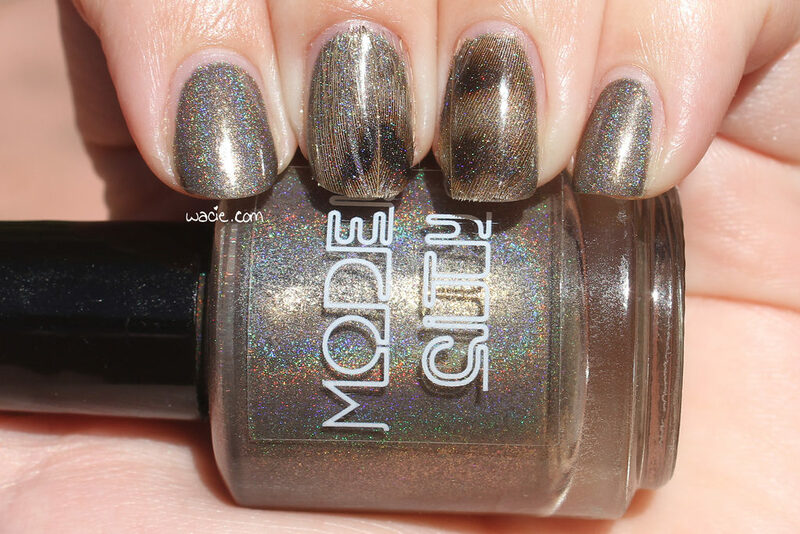 Don’t Open Dead Inside is a cool-toned brown polish with a strong green-to-gold shifting shimmer, iridescent flakies, and a smattering of holo. Application was great with this polish; I had an opaque first coat, and only used additional coats because I like the thickness of it. The polish dries with a glossy finish; I used top coat for shine and protection. I have to say, I really dig this polish. I love the zombie-chic aesthetic it goes for, because it does it really well. It’s something unique in my collection; I don’t have anything like this. 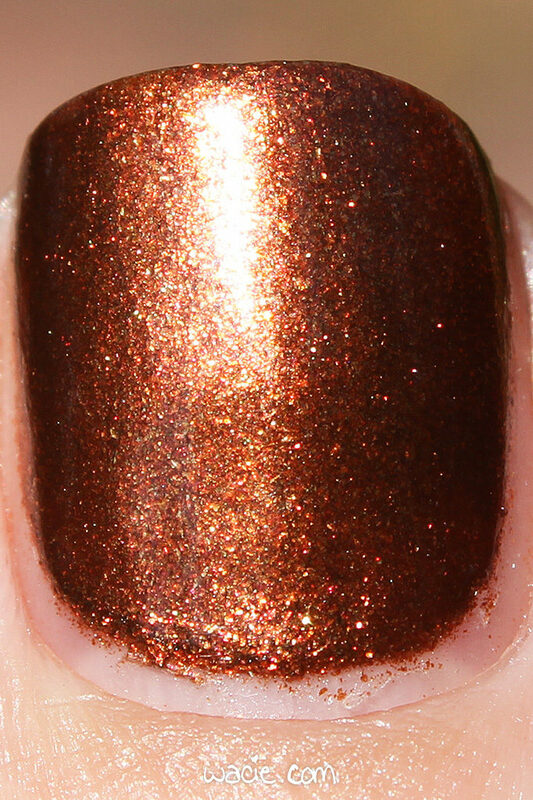 I also appreciate the kitchen sink approach to this polish, and this applies to all of the Bee’s Knees Atlanta exclusives; they’re so multi-faceted and complex. Zombie nails never looked so good! Don’t Open Dead Inside was an Indie Shop Atlanta event exclusive; other Bee’s Knees Lacquers are sold on their website. Happy Tuesday, reader! Yesterday was a busy day, so I’m only getting to posting Manicure Monday today. It turned out to be a good thing, since yesterday was rainy. 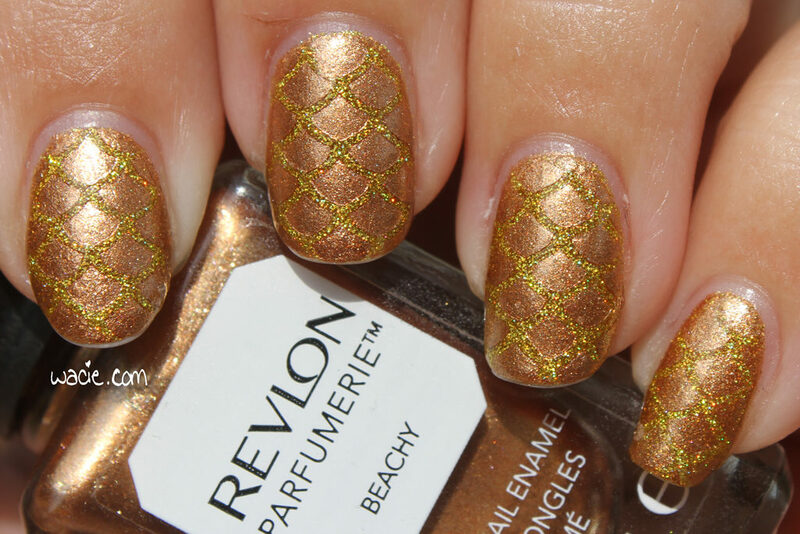 For this look, I used Revlon’s Parfumerie scented polish in Beachy over Chaotic Glitz‘s Gold Rush. The scaled design was done with Ribbits Stickits‘s Mermaid’s Tale vinyls. Originally, I’d planned to wear Beachy alone. Since it is a scented polish, I didn’t want to interrupt the scent with top coat or anything else. The more I thought about it, though, the more I knew I had to get at least one more polish in here. I have too many to just use one at a time. It’s just as well; the scent always leaves my nails as soon as I wash my hands, anyway. Gold Rush is stunning. It’s such a bright, dazzling golden glitter, and I wish I hadn’t covered so much of it up. At first, I worried there might not be enough contrast between Beachy and Gold Rush, and that the design wouldn’t be immediately visible, but I kind of like it. 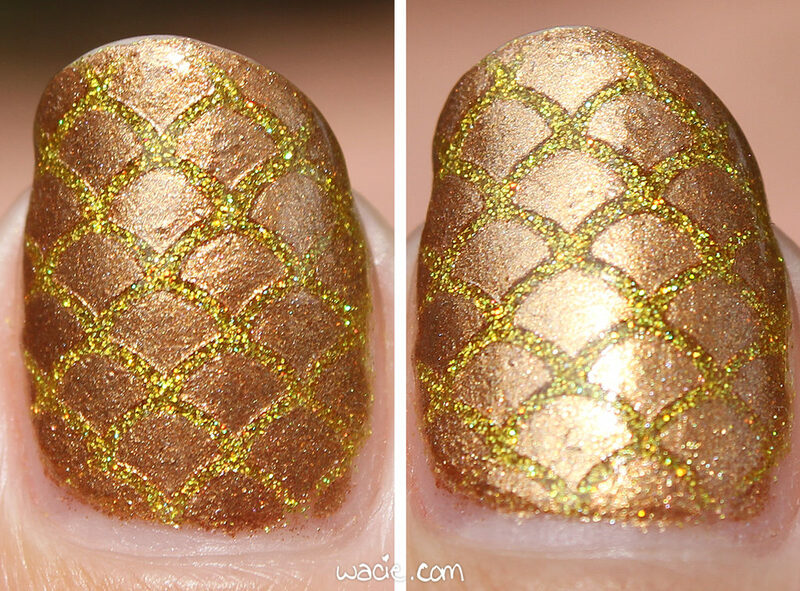 Beachy is a frosty polish and reflects differently than Gold Rush, so in different lighting conditions it does show up differently. I didn’t occur to me until I was finished that it was halfway to pineapple. I’m still thinking about going in with some green glitter to finish it up. Revlon polishes are sold in stores. 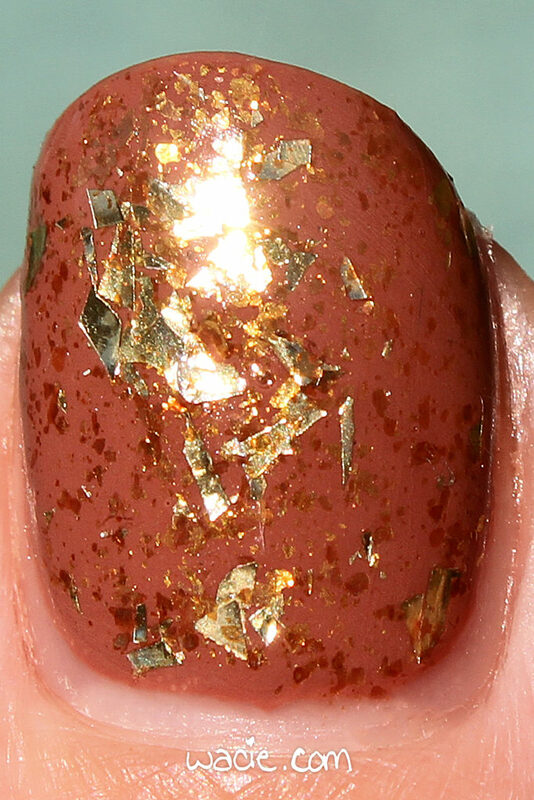 Gold Rush and other Chaotic Glitz polishes are sold in their etsy shop. Ribbits Stickits vinyls are sold on their website. Happy Monday! 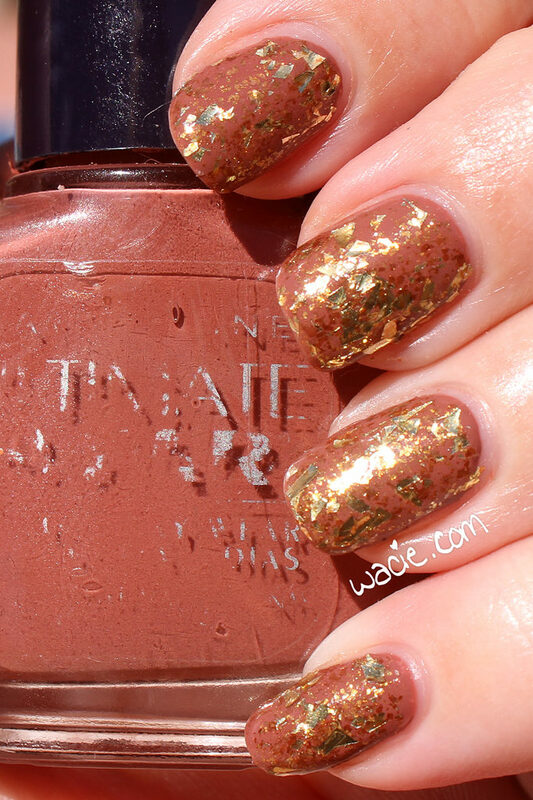 Today’s look makes use of a vintage Maybelline polish that I’ve had since at least 2005. 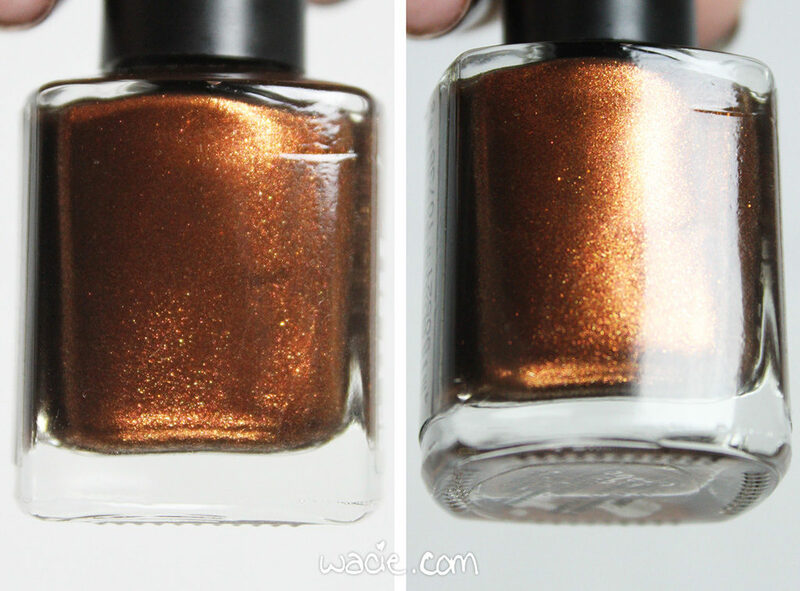 This is Tawny underneath Formula X for Sephora’s Out of Sight. Tawny is a rich toffee brown creme. For a polish of its age, it actually applied quite well; the consistency was a little on the sticky-thick side, and was a little annoying to work with. I could have thinned it, but it wasn’t quite that bad. The worst thing was the shedding brush. It left quite a few strands on my nails, and I wasn’t able to get all of them off. I just put more polish on top of it. Out of Sight is gorgeous. It’s super-blingy, and nearly blinded me in the sunshine. It’s also got some golden flakies in there. 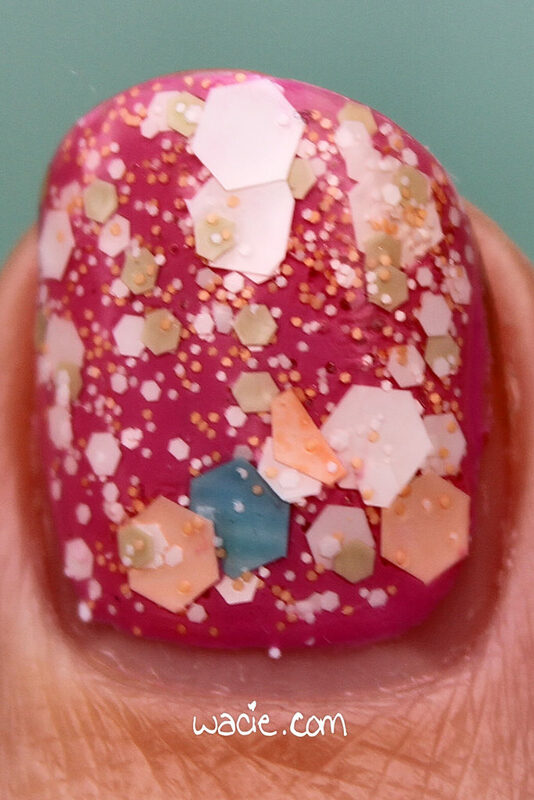 This polish has the same issues that all the shredded glitter toppers have with smoothness, and I talked about that a bit in last week’s post. This one is maybe ninety percent smooth with a few jaggies. Happy Monday, reader! It’s the official first day of spring, and it’s time for spring manicures. Probably nobody was thinking brown for spring, but it’s what I’m rocking. For a change of pace, I got some feathers out, and there’s something about birds and spring, right? For this look, I used Model City Polish‘s Dark Roast, feathers from a Ciaté nail art kit, and Digital Nails‘s Spectraflair holo top coat for an extra holo finish. All photos were taken in direct sunlight outdoors. 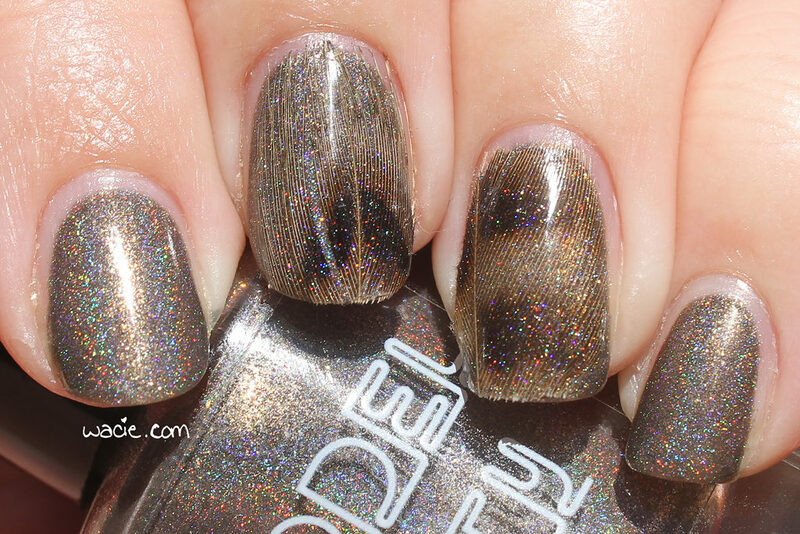 Dark Roast is a great holo. 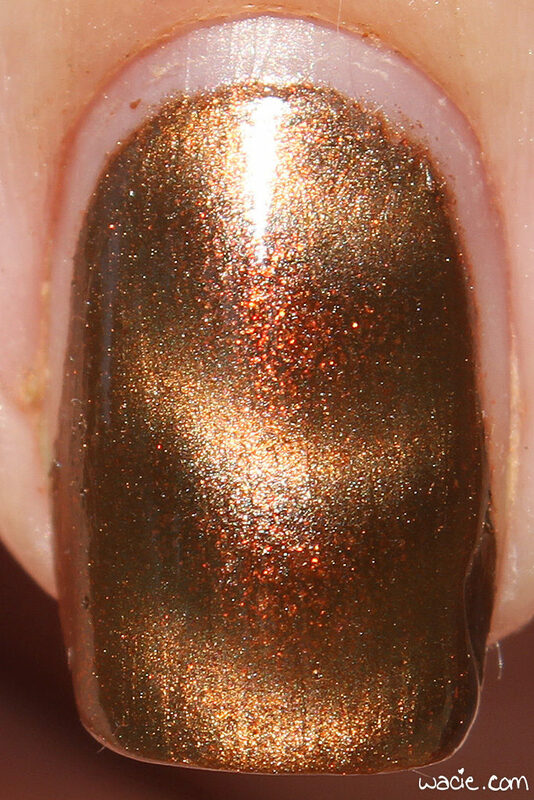 It’s a rich brown, but the holo is pretty strong, and there are these tiny gold shimmers in it. It dries shiny. I felt kinda bad putting the feathers over it, like it was too pretty to cover up. The feathers were kind of a pain, and as you can see, it looks a little messy, but I’m rolling with it. 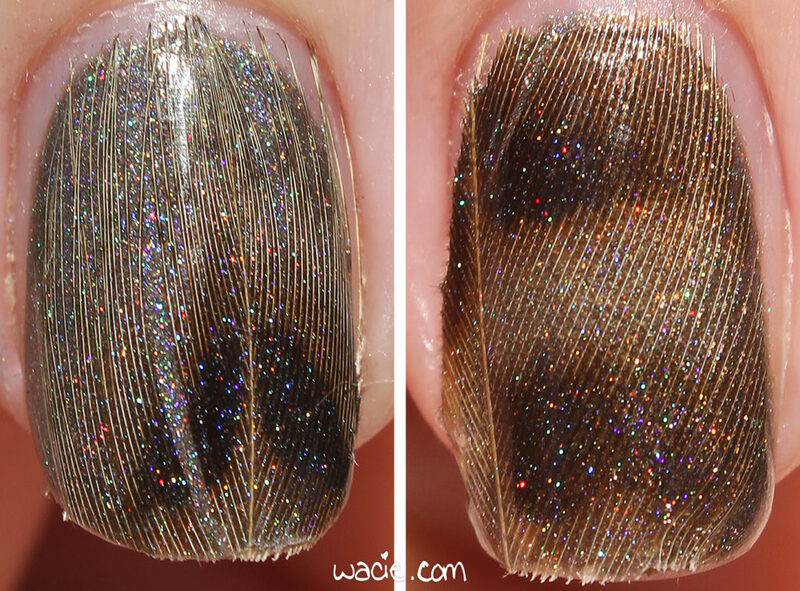 I used the holo top coat over the feathers just to pull it all together, and I think it came out all right. 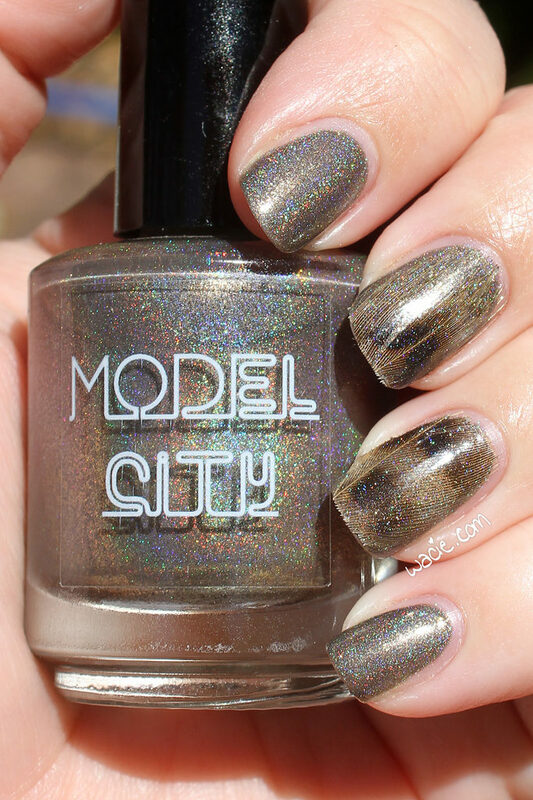 I heard a sad rumor that Model City Polish closed down, and though I haven’t seen anything official, I do see that their etsy shop is on hiatus. That really bums me out. Model City was one of the first-ever indies I bought from, they gave me my first press samples, and everything they made was quality. It’s sad to see them go. I feel like a bad fan because I’ve just heard about it. I don’t know where to get Ciaté’s nail art kits anymore. 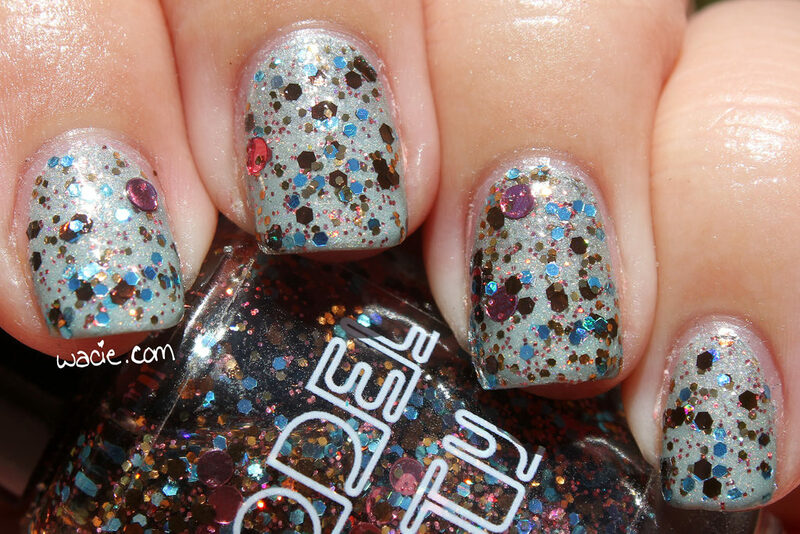 Digital Nails’s Spectraflair top coat is sold in their etsy shop. Hello hello! 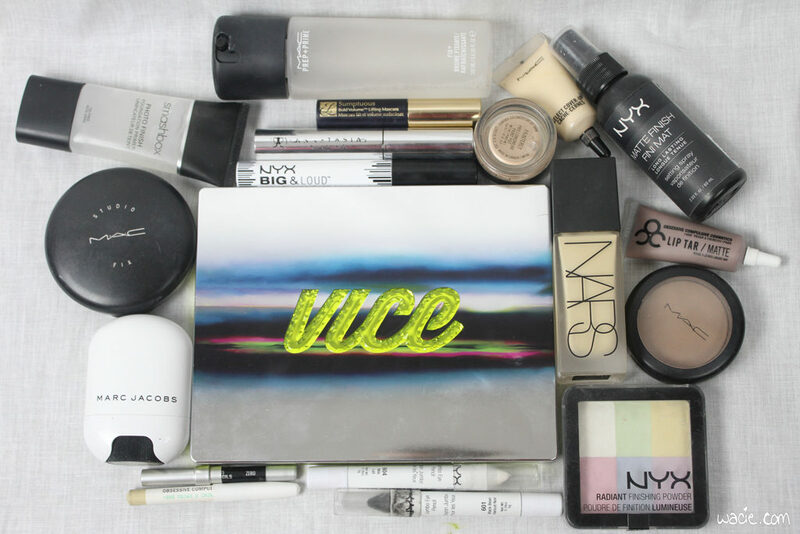 It’s time to share with you the makeup products I plan to use during the Winter 2016 season! 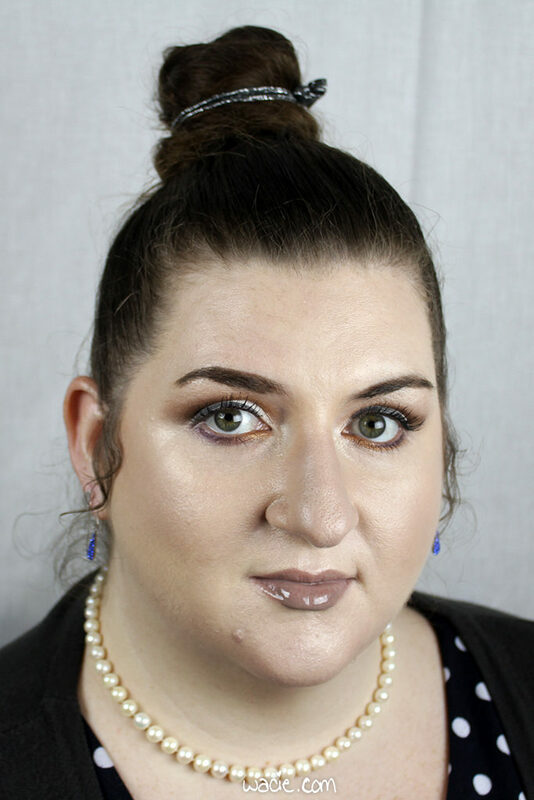 Last season, I played around with some extreme smoky eyes and bold lip colors; this season, I wanted to experiment with colorful eyes and neutral lips. I’m excited to try some new things! If you’re familiar with fall’s Project Pan, you know that this isn’t a true PP challenge; this is a way for me to spend some quality time with makeup products I’ve bought and have never really used. It’s like a makeup date. For the next twelve weeks, I’ll be using these products on my face exclusively until the beginning of the next challenge, when I get my summer makeup out in March. I suppose I’ll start with things that carry over from the last challenge. I won’t mention too much about essential things like foundation and primer, but there is a bit of overlap. 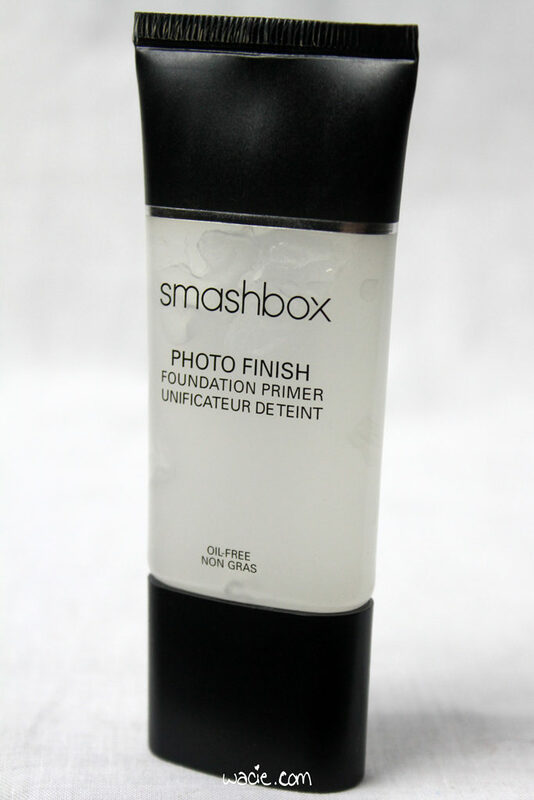 Honestly, I don’t think I’ve written a makeup post lately without talking about this primer. Yes, it’s a big player in this look. 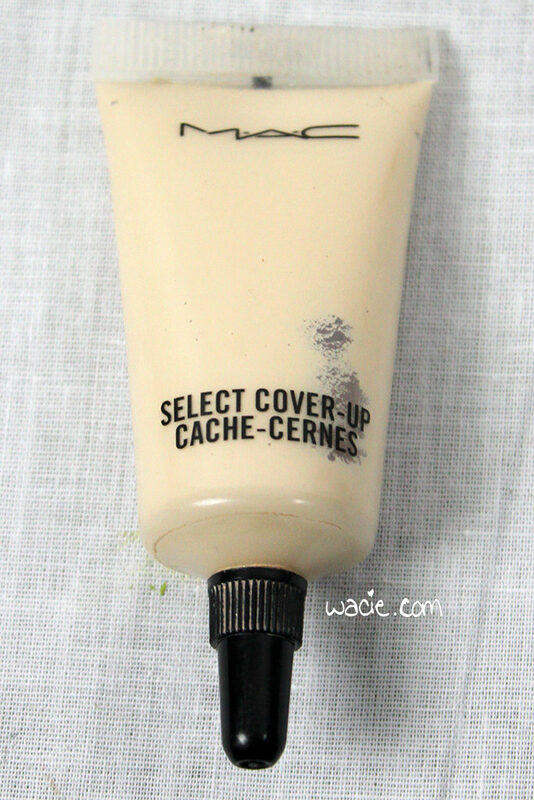 When I ran out of MAC Studio Fix Fluid, I was torn over what to replace it with. Part of me wanted just to get another bottle, because it actually was a good fit for me. I’m a person who likes to try new things, though, so I decided to go for a different foundation. There’s a part of me what wishes I’d just stayed with the MAC, though. I like the NARS foundation enough, but the thin consistency is annoying sometimes, and it’s not as neutral as I thought it would be. I’ll keep using it, but I probably will return to Studio Fix Fluid once it’s gone. Yep, this again! I probably shouldn’t bother to include it since I used it like all of twice last cycle, but I already had the photo, so here it is. I have a love/hate relationship with this powder. I love how complete it is; not only does it set makeup beautifully, it also brightens, color-corrects, and illuminizes, like it’s many products in one. However, it doesn’t keep oil in check, and the luminizing feature ends up making me look even more shiny than I am. It’s perfect for cool weather, but a no-go in the summer. I’m trying to use it up. 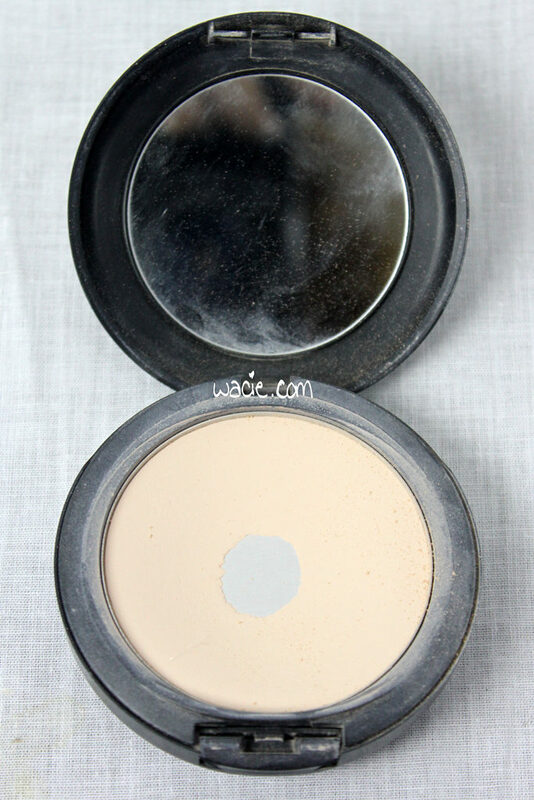 This powder is the best! The full coverage basically renders my concealer obsolete. 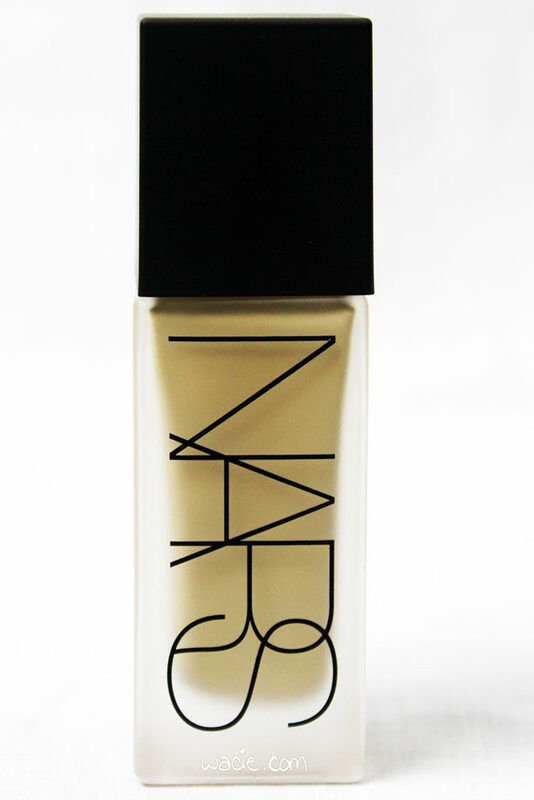 Using it over liquid foundation is probably overkill, but it’s really the best complement to medium-coverage foundation. In the fall and winter, I want all the coverage I can get, and this helps me get there. Remember this? Since I’m using neutral colors for my lip and cheeks, I wanted a neutral highlighter, and this was the best one. When I reviewed this, I reported that it was super creamy and blendable, but that was over the summer. Now that tepmeratures are lower, the stick isn’t quite so creamy, and it’s not as easy to use and apply. It’s a little disappointing. During fall’s challenge, I only used this for contouring my nose, chin, and forehead. I’m also using it as a blush this time around because I wanted a neutral base look. In this capacity, it hovers somewhere between blush and contour, and I really like it. Yes, this again. It’s still not dried out, so I’m gonna keep using it. This stuff goes a long way to keep me from looking powdery and unnatural. 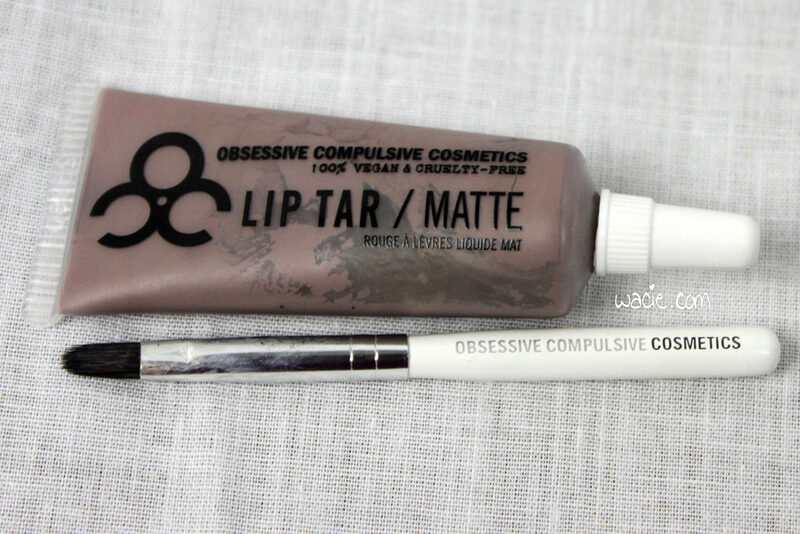 It doesn’t keep me mattified, but it makes my makeup look dewy and fresh. The bottle is almost empty; I’m definitely going to repurchase. Having two facial sprays is probably overkill, but I feel like there’s a place for them both. 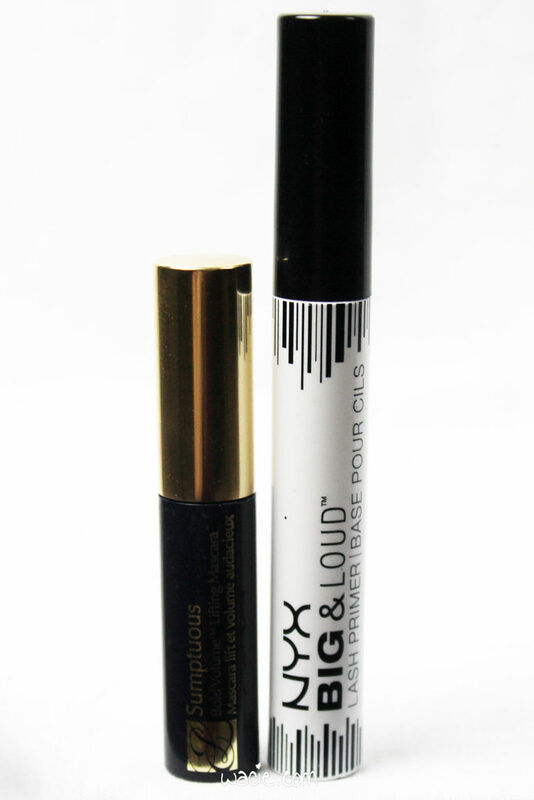 The NYX spray sets my foundation, but I still use a setting powder, just for safety. 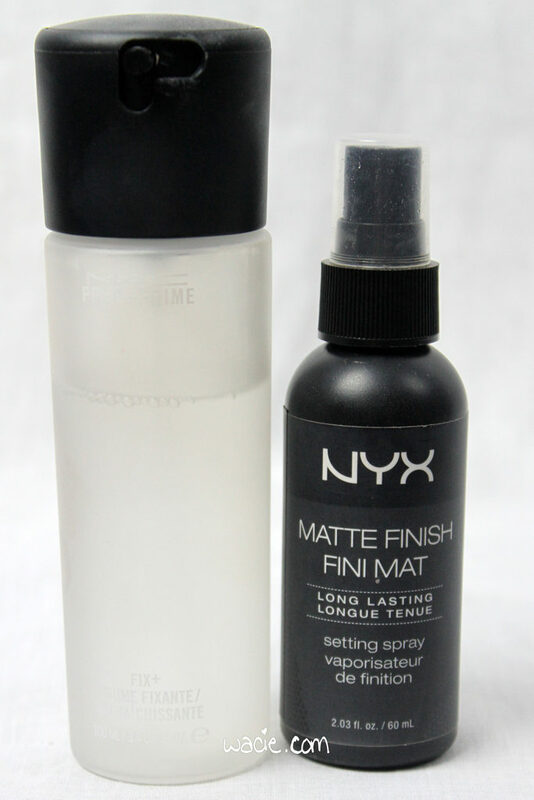 The Fix+ spray keeps that last dusting of powder from looking too powdery. Probably unnecessary, but I like it. Painterly is also making a return in this cycle. I’d rather be using an actual primer, since my lids are kind of oily and creamy products like this have never worked for me in the past, but I’m making it work. Black Bean was a godsend last cycle for my ultrasmoky eye, so I’ll be using it for the same purpose this time around. 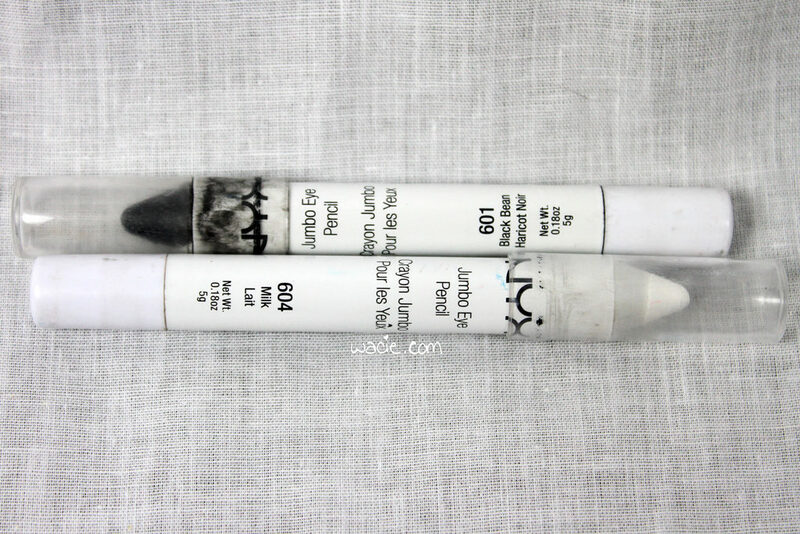 I’ll also be using the Milk pencil for extra-white whites and extra-bright brights. 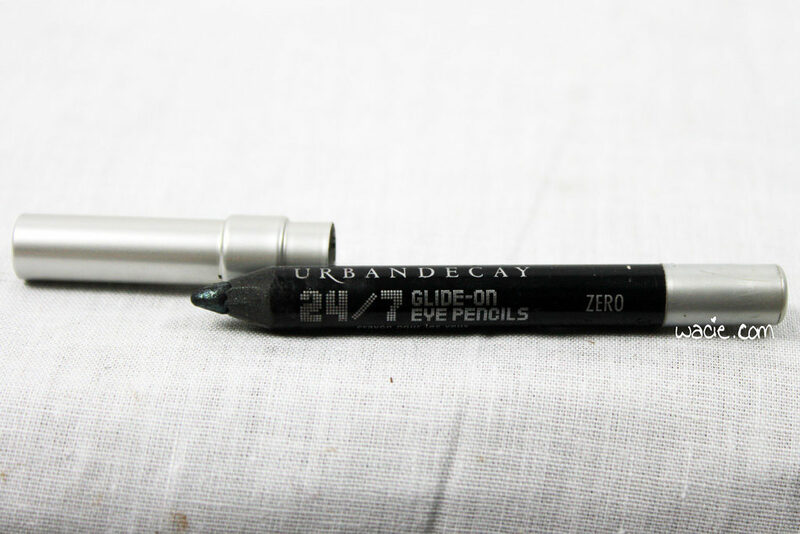 These pencils make eyeshadow look the way it’s supposed to look. I’ve had this palette for a while, and I’ve never used it until now. I chose a colorful palette to go with this look that’s otherwise very neutral; I wanted eyes that really stand out. I’ll talk more about this, keep reading! I talked at length last time about my love for lash primers, and I’m still very happy with this one. This is a sample I’ve had in the drawer for a while, and I’m finally using it! I don’t really care for it, to tell the truth; the formula is fine, but the brush is huge and I don’t like huge mascara wands. I find them difficult to work with. 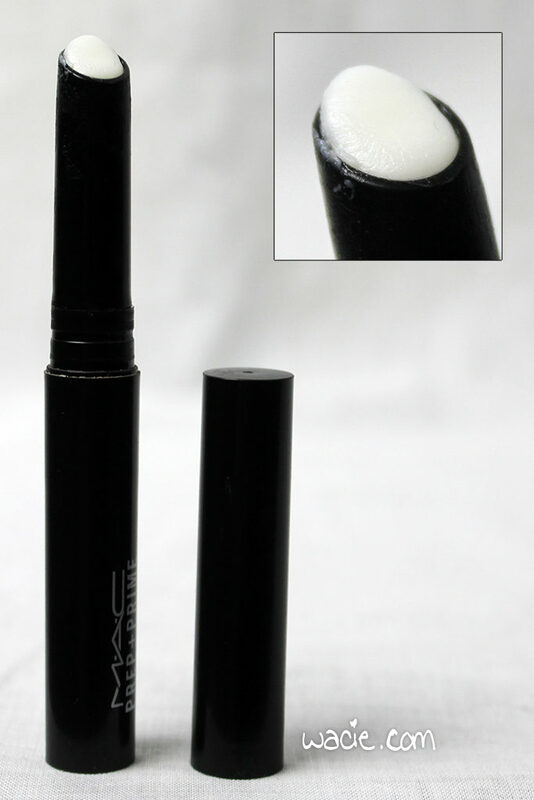 This is my favorite lip primer! It’s practically gone; in this photo, it’s twisted all the way up, and I’ve been using a lip brush to apply it. I can’t wait to buy another one! 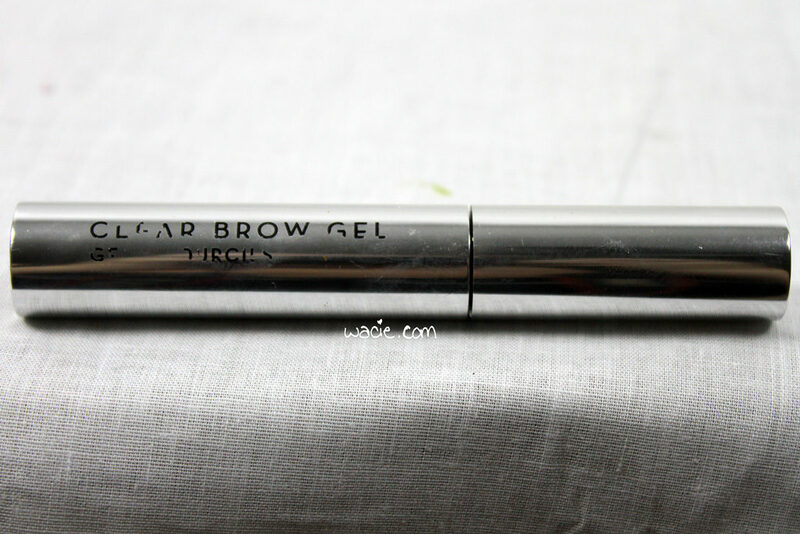 My favorite clear lip liner! Sometimes I overdraw with this, or underdraw, because it’s invisible. Lately, I’ve found that the MAC lip primer is enough to keep my lip color on, so I’ll probably phase this out once it’s gone. I forgot to shake it up. When I started building this look, I started by choosing a lip color at random, and this is what I got, and it’s the part of this look I’m the most excited about. It’s a color I’ve never really worn before, a color I’ve never really seen on people. At first, I wasn’t too sure about it and nearly put it back. I put it on, though, and I loved the way it looks on me. Sure, it’s not a conventional color, but it’s strangely wearable while also quite unique. I am really enjoying it. While looking at densely populated palettes like Vice 3, I’ve often wondered what would happen if I wore the colors as they’re placed. Sure, it’s not organized to be worn a certain way, but I’ve always wanted to try wearing shadows one line at a time to see what the colors would look like, and just to experiment with different combinations. 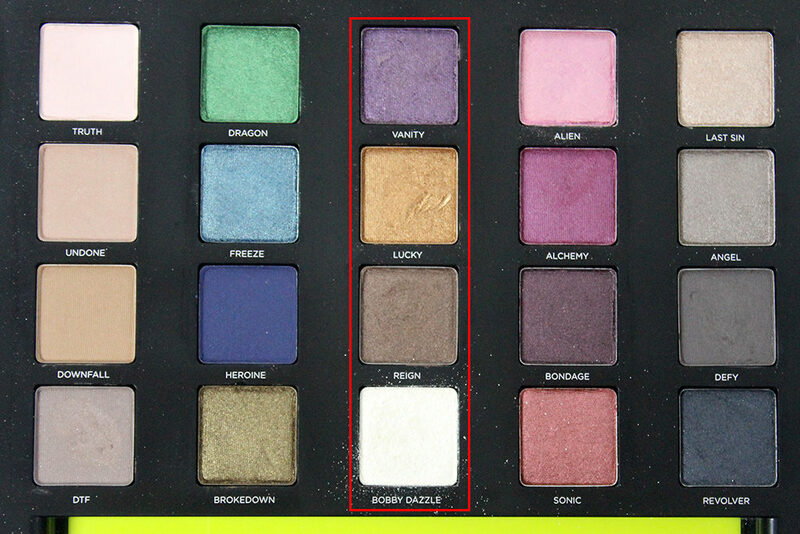 That’s the idea behind the eye looks I’ll be doing with this palette. In my first week, I’ll be using Vanity, Lucky, Reign, and Bobby Dazzle together. I used the Milk pencil on my lower lid with Painterly on the upper lid and brow bone. I then applied Bobby Dazzle all over my lid. Can you see the difference? It’s a stark white on my lid, but a gentle shimmer on my browbone. I worked Lucky and Reign into my crease, and used Lucky and Vanity on my lower lashline. Starting with this column of shadows made this one easy; I’m definitely looking to some of the others being a challenge. Here’s the whole look! Everything on my face is mentioned in this post. I plan to do a different eye look each week to match my Manicure Monday look, and I’ll post the eyeshadow of the day on Instagram, so follow me there to stay up to date. I won’t do any update posts until the very end. I hope you’ll follow along with me! 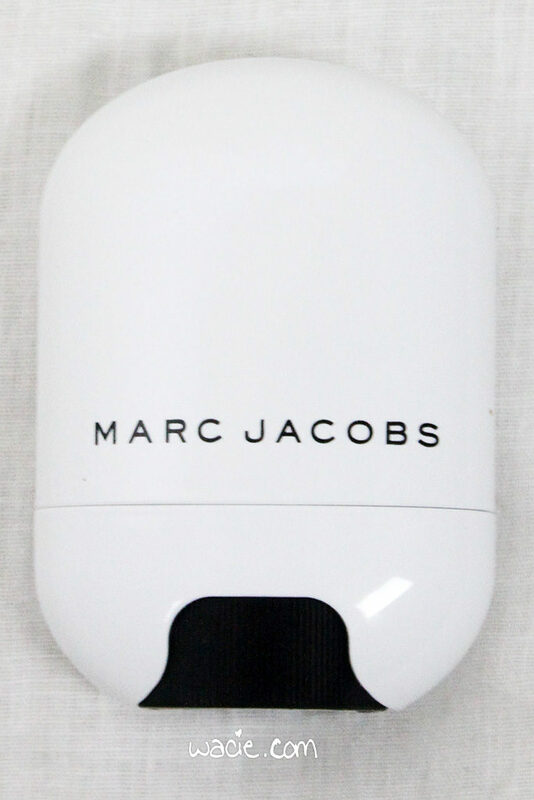 The Marc Jacobs Glowstick was sent for review, which is linked here. This post is not related to that review, and my opinion is not swayed by free stuff. Everything else I purchased myself. Happy Monday! It’s the last Monday of the year, and hopefully you got through it unscathed. There’s only a week left of this dreadful year, and I cannot wait to leave it behind. I’m going to send it off right, with a glitter gradient! 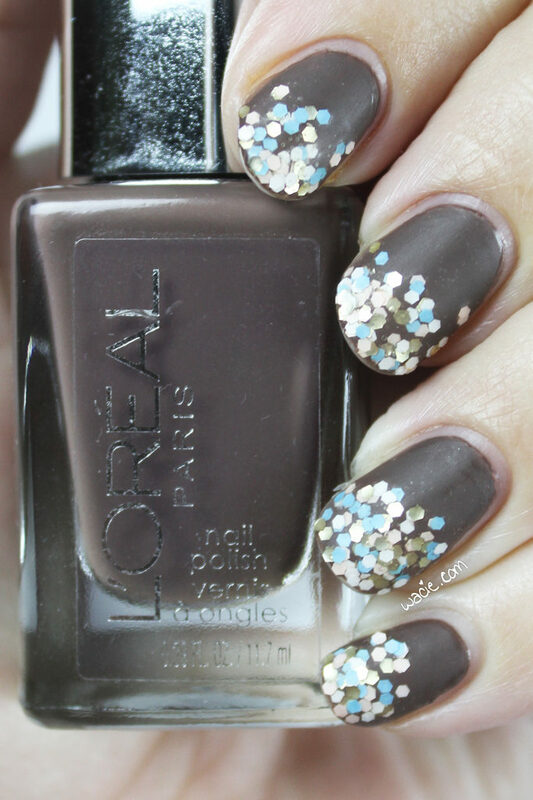 For this look, I used L’Oreal’s Cockatoo’s Wisdom and Nails Inc.’s Upper Street. 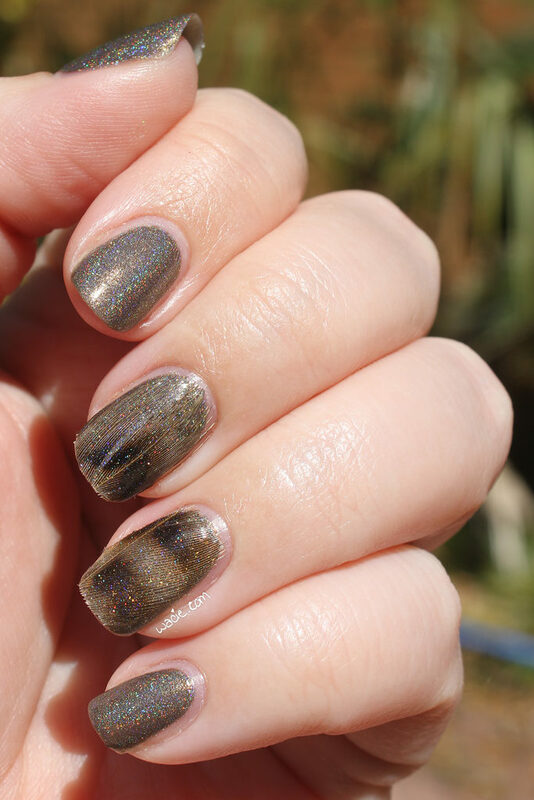 I loved Cocktaoo’s Wisdom in the bottle; it’s this rich, cool brown, but it was hard to get opaque on my nails. It’s why I put the glitter on the top of the nail instead of the bottom, where I would have rather put it, but I needed it to cover the streaks that were still somehow left behind, even after three coats. It was really disappointing. On the plus side, despite coverage being wonky, it had a lovely shine to it. I felt a little bad mattifying it. Upper Street is a pretty fun topper. By indie standards, there isn’t a lot going on in it; all of the glitters are the same shape and size, and it’s just color and finishes that are different, but I think it’s fun. I wanted cool colors to complement the cool brown base, and I think the pink and blue pastels do that very well. There are some metallic gold hexes in here also, but mattifying them hid them somewhat. I was hesitant to use this, because I’ve broken two Nails Inc. caps recently and had my polishes dry out. Hopefully this one is fine. Cockatoo’s Wisdom has been discontinued by L’Oreal, but other L’Oreal products are sold nationwide. Upper Street is also discontinued; Nails Inc. is available at Sephora. Swatch Sunday time! I love this swatch. 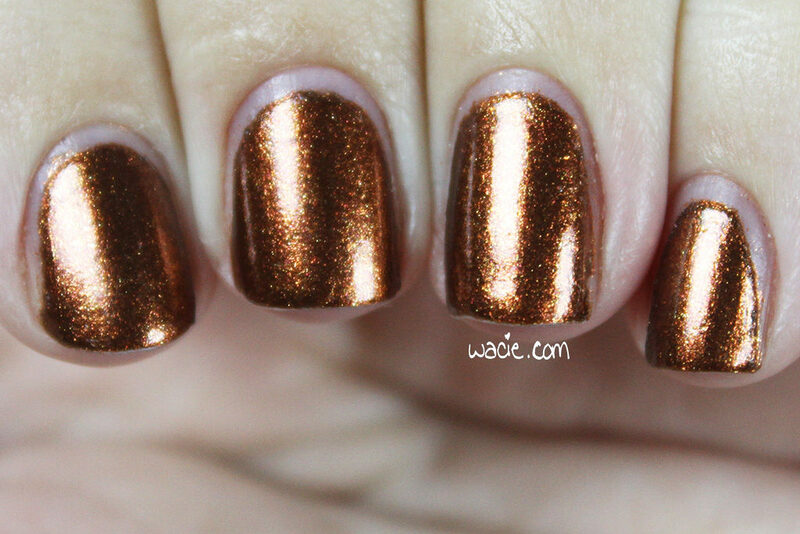 This is Sonia Kashuk’s Two Cent, and it’s probably the prettiest copper polish I’ve ever worn. I’m wearing it here at three coats with Seche Vite. 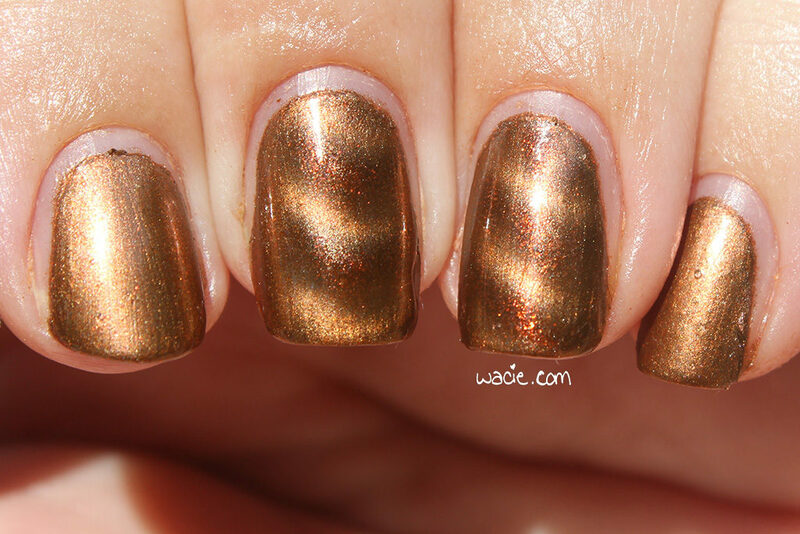 Two Cent is a shimmery golden copper brown polish. Application was good; the product consistency is a little on the thin side, but was still easy to work with. The first coat went on a bit light; the nail was covered, though the coverage was streaky. Additional coats were necessary to even it out. It dried quickly and with a smooth, glossy finish. I still used top coat for extra shine and protection. I love how shimmery this is. It’s such a warm and dimensional shade. When you look really closely, you can see all the different colors that make up the big-picture shade; there’s red, gold, copper, and brown, and that’s just to begin with. 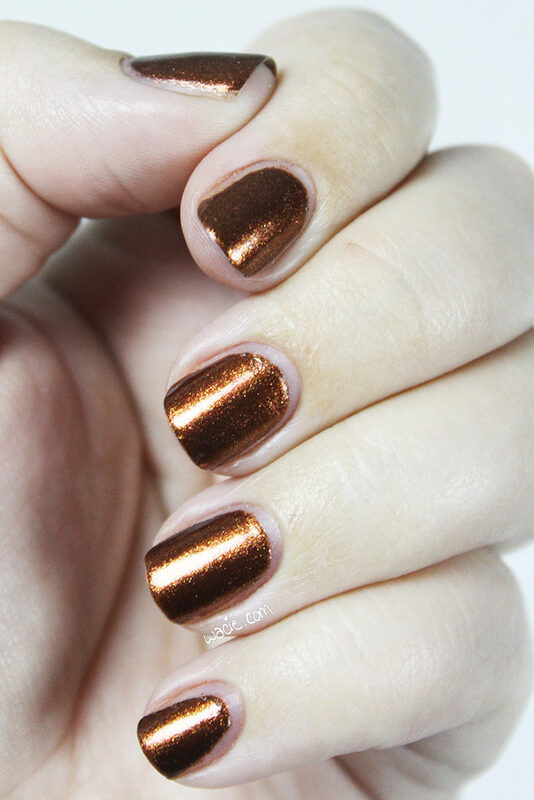 I’ve always loved these warm copper shades; it was always one of my favorite lipstick shades when I was growing up, and wearing it on my nails now is pretty cool. In the sun, the colors warm up big-time. In the studio, it looks way more brown than copper, but in direct sunlight, it looks like liquid pennies. Two Cent appears to have been discontinued; other Sonia Kashuk polishes are available at Target. Happy Monday, reader! 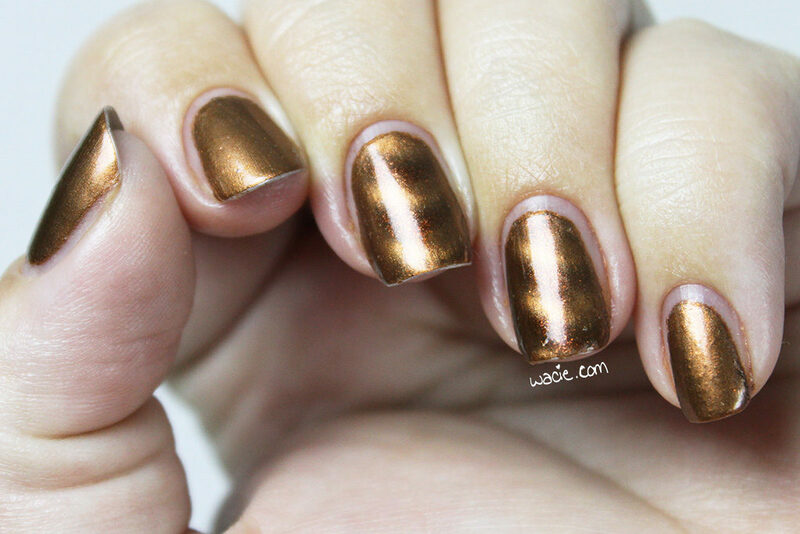 Remember magnetic polish! I’m bringing it back! 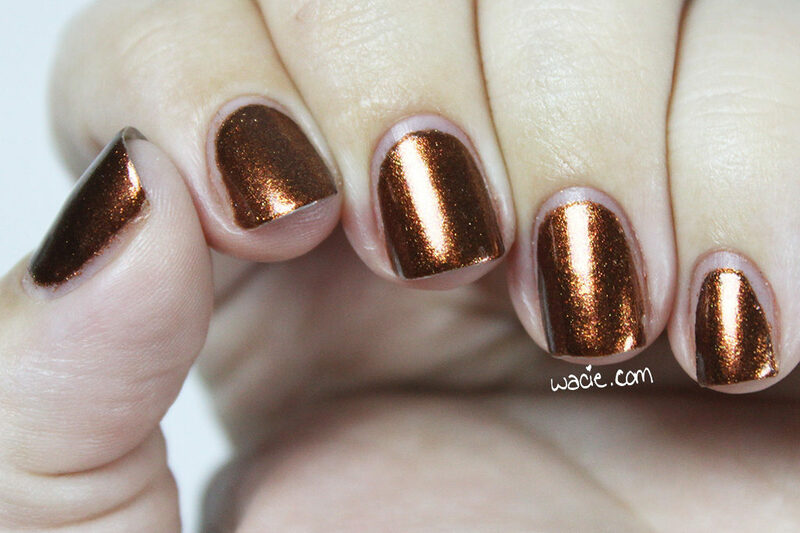 Today’s look was done with Sally Hansen’s Kinetic Copper; this is three coats of Kinetic Copper with one coat of Seche Vite. So we all remember 2011, right? Maybe it was 2012. 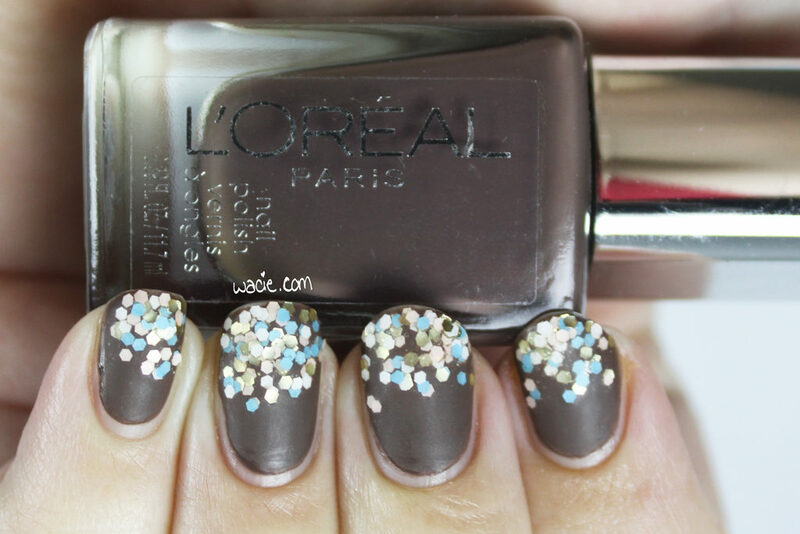 That time had a lot of really fun and, looking back on them, really questionable nail trends. Magnetics, feather toppers, crackle toppers… It’s so fun to look back on looks like these with what we know now. I wasn’t huge into nail art at that time, and this was way before I discovered indies, so anything new was really exciting. Even with as popular as magnetic polishes were, I’ve still only worn like three of them ever, and that’s why the novelty hasn’t completely worn off for me. 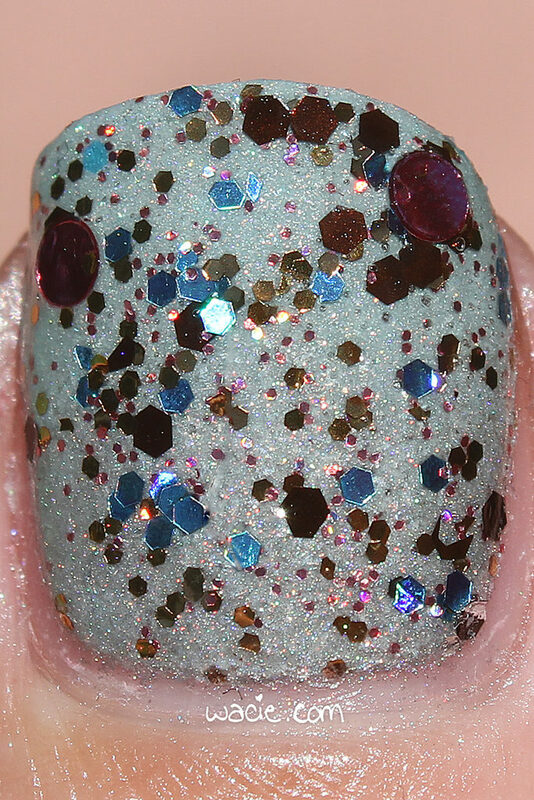 I kind of wonder if we’re going to look back on gel-effect polishes and Liquid Sand with the same kind of dismissal. 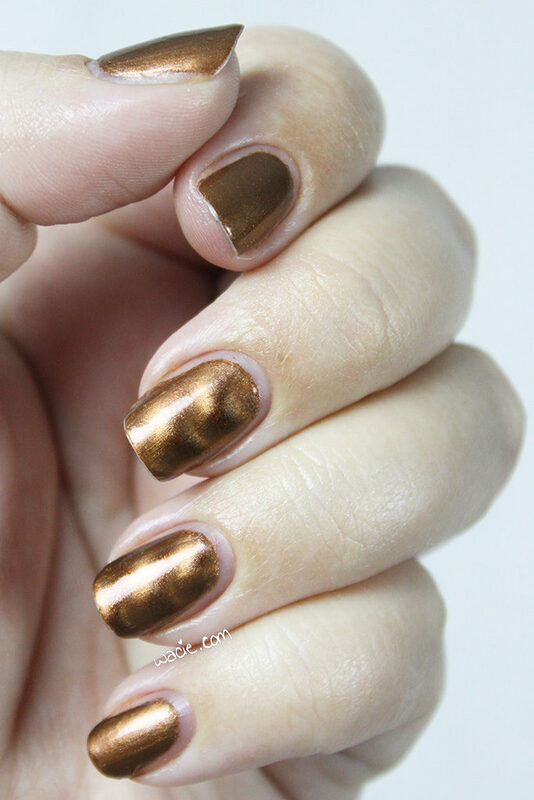 Kinetic Copper has the benefit of being a really pretty polish with or without the magnetic effect. As you can see, I only used the magnet on my accent nails; let’s not go too far into the past, shall we? 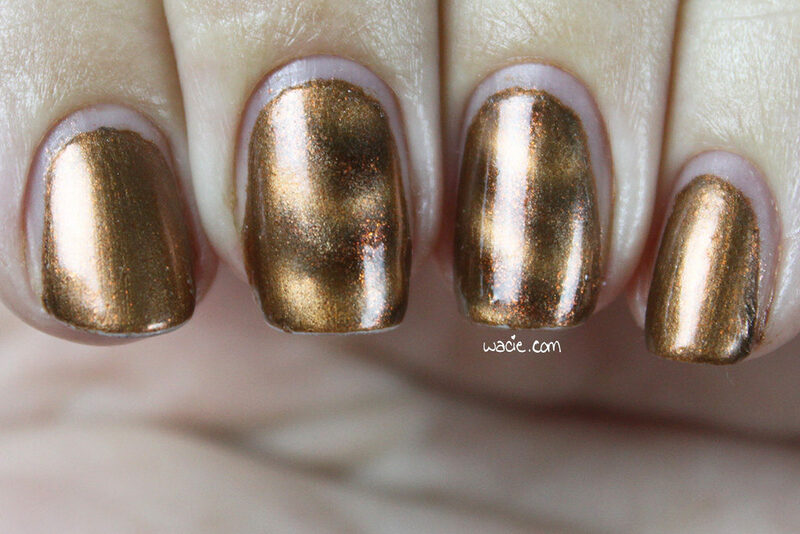 This rich bronze has a lot of copper shimmers floating around in it, so even if you just wear it as a shimmer polish, it’s a really nice look. 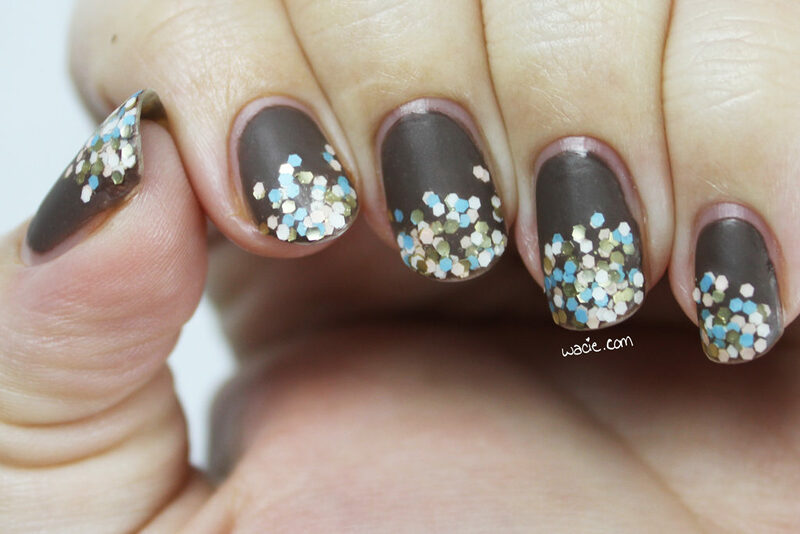 The magnet deepens the polish to a rich brown, and the wave pattern gives it a cool cats-eye cabochon effect. It’s still cool, even if it is dated. You can see the magnetic effect best in the sunlight photos. I never get a good even pattern because my nails curve so much; it’s strong in the center and only in the center. It looks fantastic in the sunlight, though, the copper shimmers really come to life out here. 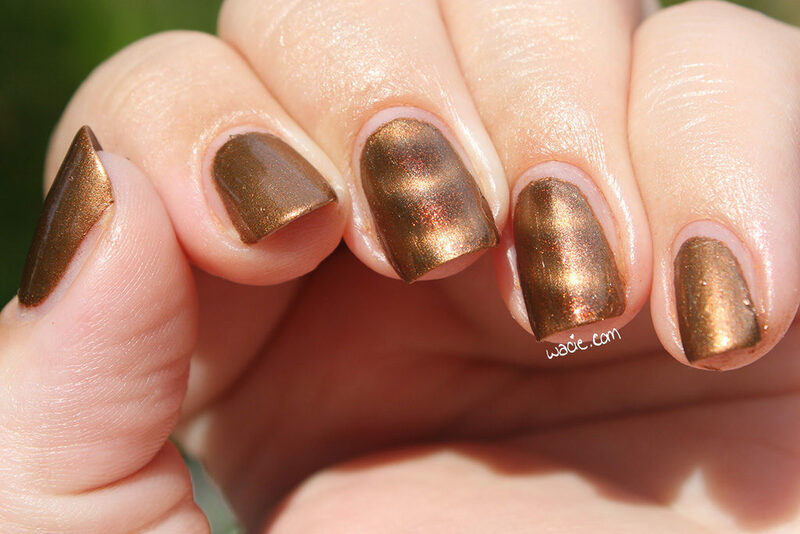 Kinetic Copper and the Magnetic line are discontinued by Sally Hansen; other Sally Hansen polishes are available in stores nationwide.